Why commute? Adapt. 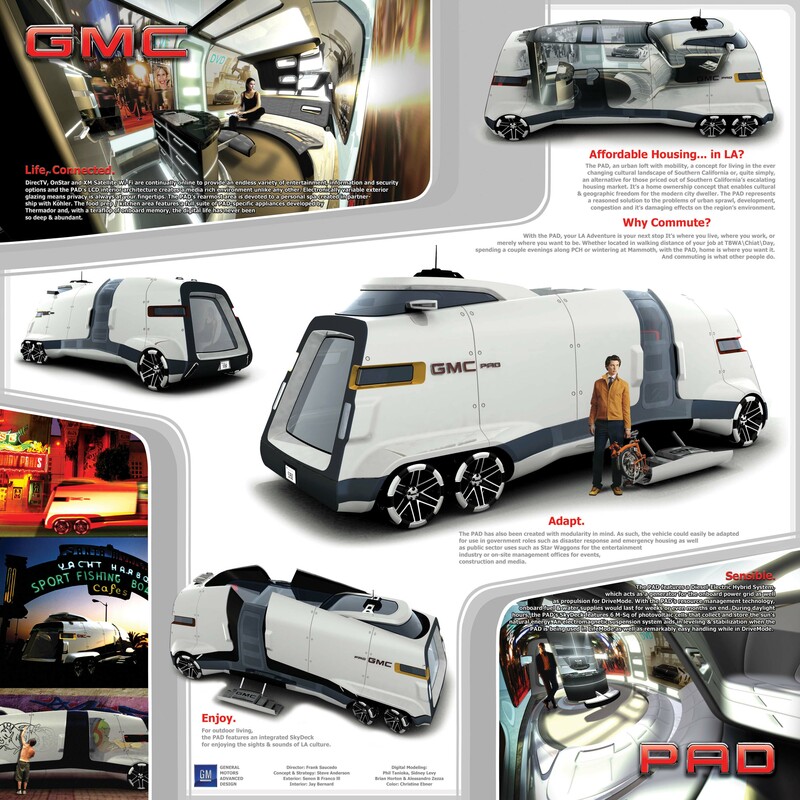 That’s the thinking behind the GMC PAD, which offers an innovative look at an urban loft with mobility. It’s a home ownership concept that enables cultural and geographic freedom for the modern city dweller. 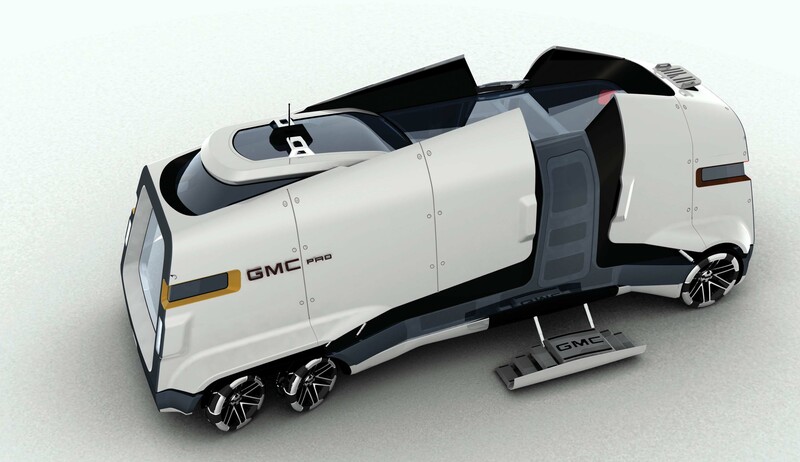 The GMC PAD features a diesel-electric hybrid system for propulsion while in DriveMode, and serves as a generator for the onboard power grid for LifeMode. The media rich environment is unlike any other, and comes with an endless variety of entertainment, information and security options. With the GMC PAD, home is where you want it. And commuting is what other people do. The GMC PAD, an urban loft with mobility, a concept for living in the ever-changing cultural landscape of Southern California or, quite simply, a modern alternative for those priced out of Southern California’s escalating housing market. It’s a home ownership concept that enables cultural & geographic freedom for the modern city dweller. It’s a concept that represents a reasoned solution to the problems of urban sprawl, development, and it’s damaging effects on the region’s environment. With the PAD, your LA Adventure is your next stop. It’s where you live, where you work, or merely where you want to be. Whether located in walking distance from your job @ TBWAChiatDay, spending a couple evenings along PCH, or wintering at Mammoth, with the GMC PAD, home is where you want it. And commuting is what other people do. The GMC PAD features a Diesel-Electric hybrid system, which acts as a generator for the onboard power grid as well as propulsion for DriveMode. With the PAD’s resource management technology, onboard fuel & water supplies would last for weeks or even months on end. During daylight hours, the PAD’s SkyDeck features 6 M-Sq of photovoltaic cells that collect and store the sun’s natural energy. An electromagnetic suspension aids in leveling & stabilization when the PAD is being used in the LifeMode as well as remarkably easy handling while in DriveMode. 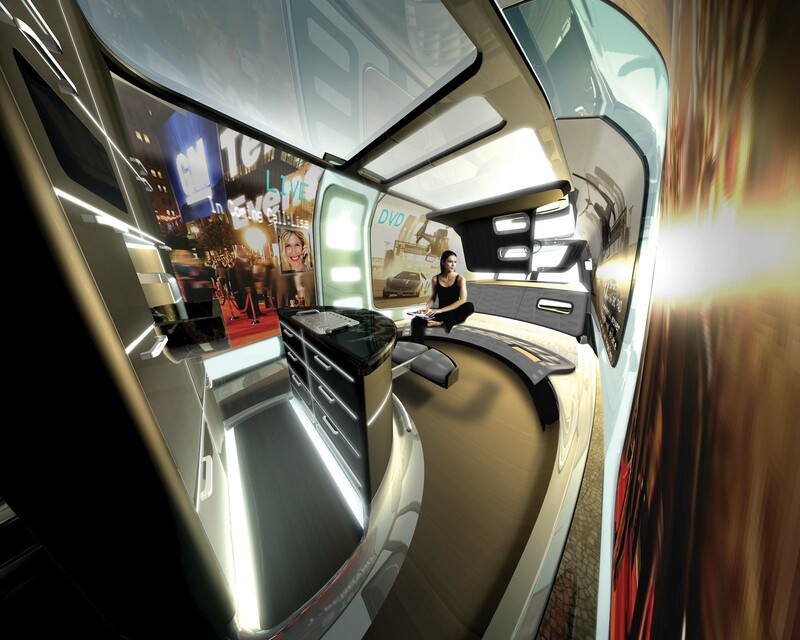 Direct TVä, OnStarä, XMä Satellite Wi-Fi and are continually online to provide an endless variety of entertainment, information and security options and the PAD’s LCD interior architecture creates a media rich environment unlike any other. Electronically variable exterior glazing means privacy is always at your fingertips. The PAD’s rearmost area is devoted to a personal spa created in conjunction with Kohlerä. The food prep / kitchen area features a full suite of PAD-specific appliances developed by Thermadorä and, with a teraflop of on board memory, the digital life has never been so deep & abundant. The PAD has also been created with modularity in mind. 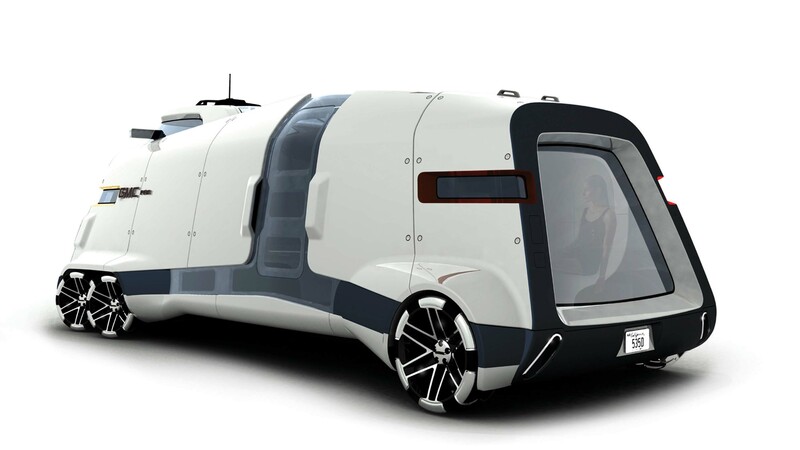 As such, the vehicle could easily be adapted for use in government roles such as disaster response and emergency housing as well as public sector uses such as Star Waggonsä for the entertainment industry or on-site management offices for events, construction, and media. For outdoor living, the PAD features an integrated SkyDeck for enjoying the sights & sounds of LA culture.